For over 30 years, Direct Group has been focused on servicing the direct to consumer market. When the company was launched in the mid 1980s, marketing was primarily through catalogues and other printed material. Over the last 15 years, the emphasis has changed dramatically to include television, 42 websites, digital publishing and online marketing. All the specialist knowledge gained over the years has allowed the group to optimise its processes, systems and infrastructure to service a direct to consumer business model. Organisationally, the group is divided into three main operating divisions, each run relatively autonomously with selected services such as warehousing, distribution and IT infrastructure provided by a shared corporate team. The Group’s original business unit, Innovations, has since expanded to include additional brands - Infashion, Damart, Fox Collection, Victoria Hill, Entertainment Masters, House of Pets, Home Collections and Gaiam. Each brand offers unique product ranges servicing different customer demographics through their Australian and New Zealand websites supported by catalogues, emails, online promotions and other marketing activities. 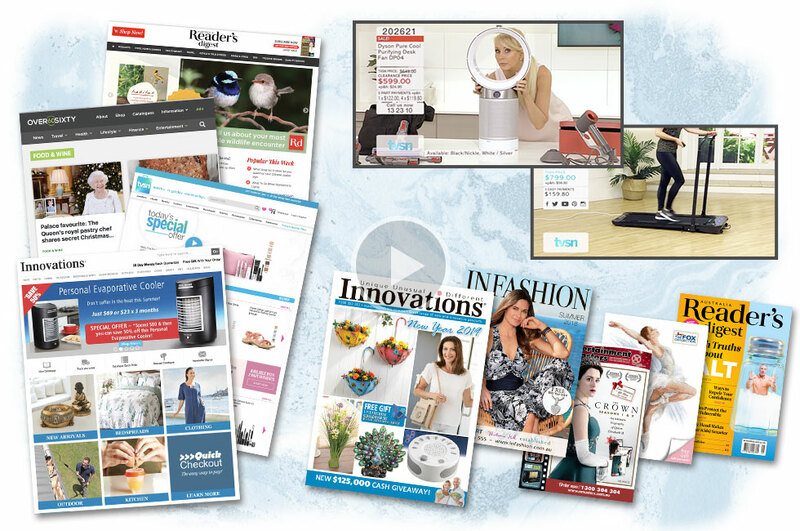 The TVSN and EXPO channels broadcast 24-hour shopping content on Freeview, Foxtel, Optus and Sky subscription TV services in Australia and New Zealand, as well as a live stream to their in-house websites. TVSN provides live TV shopping, showcasing a wide variety of merchandise in beauty, health, homewares, jewellery, fashion and electrical. EXPO’s business model is to sell airtime to external Direct Response TV advertisers in 30-second, 4-minute and half-hour formats. The Group has a range of digital and print offerings which provide a significant reach in the mature market, including Reader’s Digest, Over 60, Wyza and MyDiscoveries. Publishing the iconic brand Reader’s Digest under license, this incorporates digital and print versions of the magazine in Australia, New Zealand and across the Asia region in both English and Chinese (traditional), along with country specific websites and social media pages. The Group has developed a number of well-established brands, each servicing a market niche of clearly defined loyal customers. This has enabled the Group to develop product sourcing teams that are each totally focused on developing product ranges tailored to the interests and buying habits of their customers. The expansion of the number of brands has allowed us to offer our existing and new customers with a much richer range of products. Cross marketing between brands has increased both customer loyalty and average customer spend, making customer acquisition more cost effective and providing a launch pad for new catalogues and product categories.